In the previous post, we saw how SharePoint Framework code can be decoupled by using the Service Locator pattern and Service Scopes. In short, we are able to register instances of our services on the "global" service scope and then consume those instances from any part of our code. We can also consume instances of default services registered on the global service scope e.g. MSGraphClient, AadHttpClient, SPHttpClient etc. These registrations are done by the SharePoint Framework and all we have to do is hook into the global service scope to fetch their instances. Now, when we register our custom service on the global service scope, all components on the SharePoint page share a single instance of the service. By components, I mean SPFx web parts and extensions. In this post, to keep things simple, I will only talk about web parts but the concepts apply to extensions as well. When the first webpart on the page makes a call to the service scope, an instance of the custom service is created and returned. Any further calls made by the same or different webparts on the page will return the same instance of the service. Now this behaviour can be either good or bad depending on your requirements. The service contains a private variable count which is initialised to 0. The increaseAndReturnCount function increases the count by 1 and then returns the value. Not the best code ever written but fits our current purpose. If you are wondering where do we register this service as we only seem to be calling the consume function. The consume function does the registration for us by creating a default instance of the service, registering it on the service scope and then returning the same instance. Although multiple webparts are added on the page, they all share the same service instance and the same count variable keeps on increasing. OK, technically I am adding the same webpart multiple times on the page but the behaviour is the same even for different webparts calling the same service. By creating a new service scope as a child of the global service scope, we get a new service scope which is isolated to the current web part. This way, each web part will get it's own service scope to register and consume service instances. This way, we are able to create and maintain isolated service scopes per component on our page. In this post, let's walk-through the configuration needed to create Azure DevOps build and release pipelines for a Microsoft Teams solution. 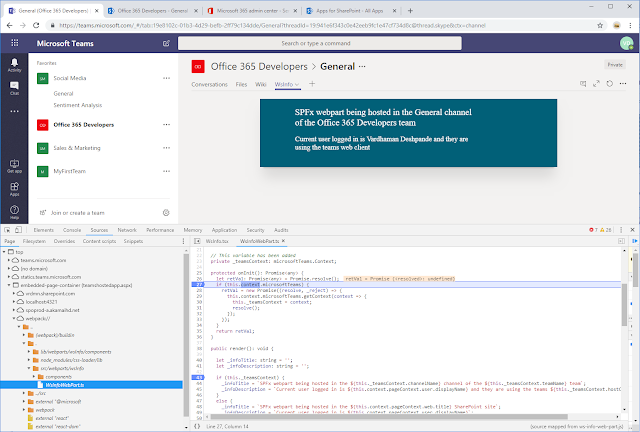 The solution is built using the SharePoint Framework and will be surfaced in Microsoft Teams as a Tab. Now to create a new Release Pipeline which will deploy the packages to the respective app catalogs in the tenants. Before moving on to the tasks, we also need to configure some variables to hold the information for the tenants, credentials etc. 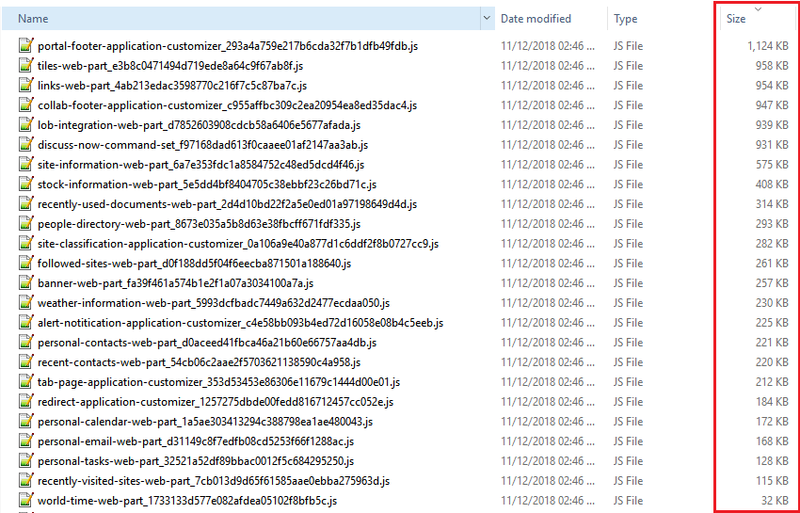 If you are feeling adventurous, you could look at cracking open the .zip file from the Release pipeline and then grabbing the id on-the-fly instead of having to specify it in a variable. And lastly, we need to publish the Teams manifest to the Microsoft Teams App Catalog. We will do this using the Office 365 CLI as well. Thanks to Elio and Waldek to get this functionality in the Office 365 CLI at lightning speed! Hope you found this walk-through useful! When working with SharePoint Online or the Microsoft Graph, there are many scenarios in which we need to read or write data without a user context. It might be a scheduled process, or it might be an operation that requires elevated permissions. In such scenarios, it is quite common for the solution to use "Application permissions" (a.k.a App-Only Authentication). This lets the solution have its own identity which can be used to grant the required permissions. When working with Application permissions in Office 365, there are a lot of moving pieces to deal with like Client Ids, Client Secrets, Azure AD App Registrations, Certificates, Add-In Registrations, AppRegNew.aspx, AppInv.aspx etc. What I want to do in this post is to explore different options for configuring and granting application permissions. There are a few combinations possible with the different moving pieces. My aim in this post is to explore them and determine which combination might be suitable for certain scenarios. We will also see some sample code which demonstrates how to authenticate with SPO and the Microsoft Graph using the different authentication options. Here is a table I have put together which summarises the different options for working with applications permissions in SPO and the Microsoft Graph API. We will go through each on them in detail. You will also get the "Access Denied" error if you try to write to the User Profile service. Reading from the User Profile service will work. If your solution needs write User Profile service access, your only option would be to use an Add-In registration (see the next section). Writing to the SPO Taxonomy Service will not work either through AAD App Registration or Add-In Registration. Read operations will work. See notes at the end of this post. Here is a sample of how to use the Add-In registration to interact with data from SharePoint. You will need the SharePointPnPCoreOnline NuGet package. If your solution needs to interact with the Microsoft Graph, the only option is to have an Azure AD App Registration. However, within the Azure AD App Registration you can either use a Client Id, Client Secret pair or you can use the Client Id, Certificate pair as well. The process to create the AAD App Registration and Certificate is exactly the same as described above in section 1. Only difference would be that instead of selecting SharePoint Online permissions, the App Registration will have to be granted the relevant permission to the Microsoft Graph. If the solution is strictly going to deal with SharePoint Online data and not any other part of Office 365, you might want to consider the SharePoint Add-In Registration approach with a Client Id and Client Secret. That way you don't have to mess around with certificates. But remember that in the future if the same solution is going to read/write data from the Microsoft Graph, you might have to create another App Registration in Azure AD. 2) For the purpose of this post, I have only considered Azure AD v1.0 endpoint as we are only concerned with organisational accounts and not personal accounts. 3) Technically, Add-In registrations created from the AppRegNew.aspx page are also registered in Azure AD. They are not visible through the AAD portal but you can list them via PowerShell. It would be great if we can get some confirmation from Microsoft about this approach being supported/recommended. But even then, we will have to manage the SharePoint permissions in a different location than the Microsoft Graph permissions. Hope you've found the post helpful! I was having a look at the SharePoint Starter Kit recently and I have to say it's a very useful collection of sample SPFx webparts, extensions and other modern SharePoint building blocks. You should check it out if you haven't already. The @pnp/spfx-property-controls package is great when it comes to having pre-created custom controls to use in the SPFx webpart property pane. One thing worth noting though is that the property pane is loaded much less frequently than the webpart code itself. The property pane is used only to configure the webpart so the code is only needed then and not when the web part loads normally on the page. To further optimize the webpart bundles, we can separate out the property pane code (including the components from the @pnp/spfx-property-controls package) and load it on the page dynamically only when the property pane is loaded. This is particularly helpful with controls like `PropertyFieldCollectionData` which is more than 700kb in uncompressed format! Also important to note is not only the filesize reduction, the main benefit of this approach is that there is no duplicate code in the components.